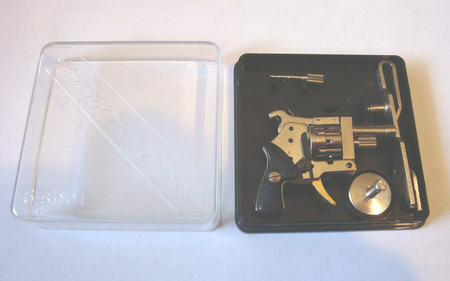 Description: THIS MINT SET CONTAINS ONE ORIGINAL 1960s NICKEL PLATED 2mm PINFIRE XYTHOS AUTOMATIC DOUBLE ACTION 6 SHOT REVOLVER, WITH A GOLD PLATED TRIGGER, ONE ORIGINAL BLUE INSTRUCTION SHEET, ONE ORIGINAL SQUARE PLASTIC CASE, ONE EXTRA NICKEL PLATED CYLINDER LOCK SCREW / SHELL EJECTOR, ONE ORIGINAL NICKEL PLATED TIE BAR ATTACHMENT, ONE ORIGINAL NICKEL PLATED CUFFLINK ATTACHMENT. The revolver body is marked "MADE IN AUSTRIA PATENT", the left black grip is marked "XYTHOS", and the right black grip is marked "AUTOMATIC", the clear lid of the plastic case is marked "XYTHOS AUTOMATIC 6 SHOT", on the bottom of the black plastic case is are the words "3822 MADE IN AUSTRIA PATENT ANDRES & DWORSKY AUSTRIA". AMMUNITION OPTIONS: If you want to add a red box of 36 2mm pinfire blanks, it can be added for $29.50 each (maximum of 4). PLEASE NOTE: All the pictures are of my Xythos Automatic set. Your mint Xythos Automatic set came from old store stock, has never been taken out of the original case or used, but may have some slight shelfware on the square plastic case. We opened your case to insert tissue padding for shipping. These sets were assembled, by the manufacturer, and do not include the plastic pin protector shown on the instruction sheet. FOR YOUR OWN SAFETY: Do not attempt to fire a projectile using the Xythos Automatic revolver (it was not designed to handle the additional internal pressure). TO PURCHASE THIS ITEM, YOU MUST DECLARE YOURSELF TO BE TWENTY ONE YEARS OF AGE OR GREATER, AND YOU MUST HAVE A MAILING ADDRESS IN THE UNITED STATES OF AMERICA. WE DO NOT SHIP GUNS OUTSIDE OF THE USA !!! 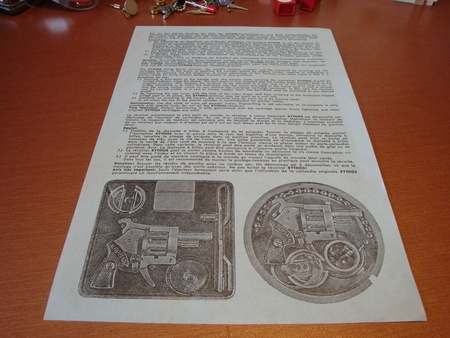 Check our other TTP ads for Xythos Automatic six shot double action revolvers and Berloque single shot pistols. Payment/Shipping Policy: Shipping is $10.00 Priority Mail only and will include insurance in the US. Multi buys wait for invoice for actual cost. I accept PayPal. Foreign payment is by PayPal Only. Payment is due in 5 days. I accept PayPal, Money Orders and Personal Checks. There may be up to a 10 day hold on shipping with personal check payment. Payment is due in 5 days.